Sometimes you get a quick hour to craft and I like to try and get lots done in that time. I love making cards individually but a batch make really helps when time is short. These new home cards were created with a roller stamp from stampin up.. Stamping with the roller is fun but a bit tricky. I do use purpose made ruler to keep me straight. I heat embossed them and then coloured in just one house. Very plain I know but cute! 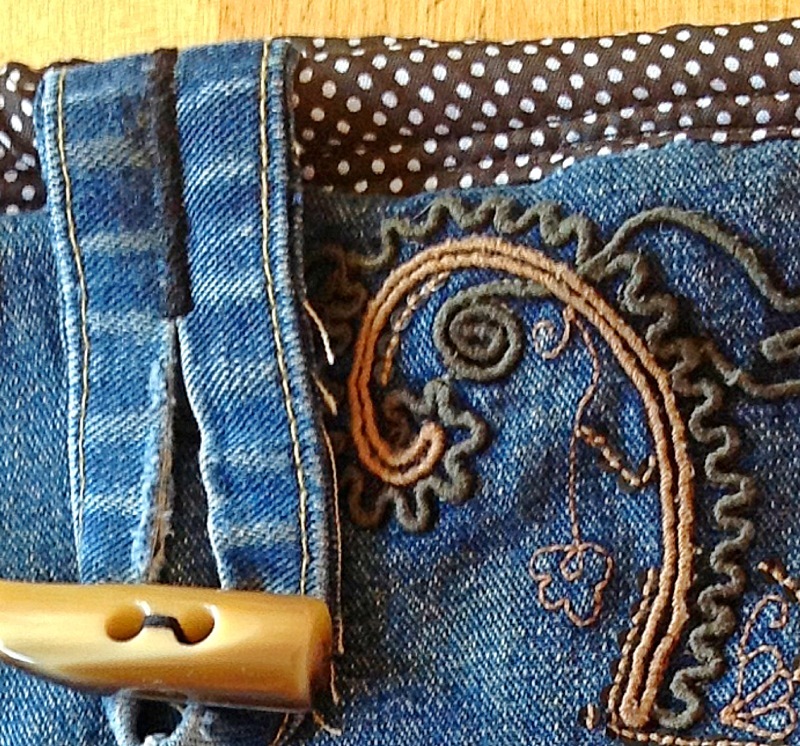 So often I make things for other people but I really wanted to make me an upcycled denim apron. I cook and bake a lot so wanted a sturdy apron and I got time this week to have a go and used some rather splendid Amy Butler fabric I have been coveting at every trip to John Lewis. What do you think? It's a creative world - sneak peek! A practical one this time at It's a Creative World.. Pop across and have a look at the great stuff going on there. Lots of inspiration. It's a Creative World post - sneeky peak, easy project! 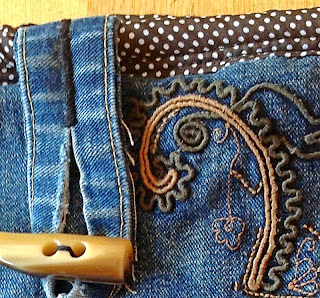 It's my turn at It's a Creative World (IACW) and I have created an easy sewing project, literally only 6 short rows of stitching.. pop over and have a look here. Sometimes a small or even a large "Thank you" card isn't enough so I have taken to making a Thank you book when everyone wants to do more than sign their name. I cover two pieces of grey board and make extra long pages that fold over that go inside. Some pages are plain or patterned card and some have inspiration sayings or pictures stamped and embossed on them. (No photos of the stamped ones sorry I forgot). I then join them together with the large book rings and decorate the front cover. I recently made this for one of the Founder Governors and ex Chair of Governors of my Daughters school. Jean is an inspiration to many of us and has ploughed her heart and soul into the school since it opened 9 years ago. She decided to retire and move to the coast. We will all miss her dearly and wish her well. The challenge this fortnight at Crafty Boots is use a stamped character. Recycled Crafty Boots Challenge - well it has a book page to start with but I have gone back to this piece of art, three times and finally settled I think!? I got the idea from somewhere but did my usual and rushed not getting all my layers in order. The final canvas looks like this with modelling paste and gold acrylic paint round the edges. Now its finished perhaps I can give it to my sister.. the intended recipient before Christmas delayed but finished - I think?. I've been very lucky to have a very creative family, especially my Nan and Mum. Needlework, art and crafts flows through them even if they didn't know they were being creative and I wanted an avenue to share my more creative side, sewing, craft and jewellery making. I find it allows me to escape the every day even if for 1/2 an hour! Thank you to the friends that join me in this journey. I came 1st twice at Crafty Boots.